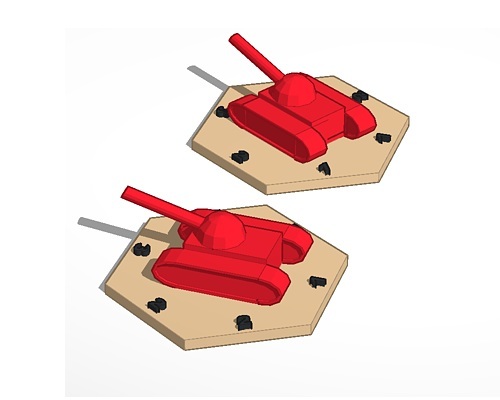 The Battle Tank prototypes we've been using and showing still use cardboard cut-outs for the game pieces. This has no effect at all on the game play, but it isn't all that visually exciting to have a little drawings on a piece of card stock. So we're going to be making some actual plastic tokens to include with the game. Pictured above is CJ's first draft of one of our tanks (note: the final versions will be solid colors). If you look closely, you can see that the numbers on the hex sides are different between the two versions due to one of the tanks facing a flat side and the other facing a point on the base. Wargames that use a hex grid typically have facing rules that require the pieces to face down the hex spine rather than the flat. This makes the distribution of front, side, and rear armor the same. You can see in the pic that facing the flat edge means that most of the armor is side armor and while that might be more accurate from a realism perspective, it's not ideal for gameplay because it is trivial for a robot to avoid ever having to shoot at the thickest armor on the front if it only protects one side. The downside to using tokens is the sheer number of them that we will need to include, unless one of our clever ideas works. The game needs at least 12 robots to work with a full game and they can be both flying and walking, so some need their wings deployed and others folded. Megamech is only one token and for the tanks we can pretty easily just make separate ones for infantry, so it's really just the minions that are the sticking point. And that sticking point is really one of weight and not cost for the actual game. If the total weight of the game + shipping box/packaging exceeds 16oz, the cost to ship each unit goes up pretty substantially and that will impact our ability to actually deliver without having to raise our price points or our Kickstarter goal.